Sometimes life feels rigid—as if nothing could ever really change. Maybe we’re afraid of taking a step of faith. Or maybe we’re too injured from the past to move forward. Or maybe life threw us a curveball and we still don’t know how to react. No matter where you find yourself, you can make the most of today. In this inspirational series, Heisman Trophy winner, Tim Tebow, shares stories from his life to illustrate what it means to seize each day for God’s glory. He challenges us to step out in courage because this is the day to act. In this powerful series, Heisman Trophy winner Tim Tebow passionately shares glimpses of his journey staying grounded in the face of disappointment, criticism, and intense media scrutiny. Following an exceptional college football career with the Florida Gators and a promising playoff run with the Denver Broncos, Tebow was traded to the New York Jets. He was released after one season. 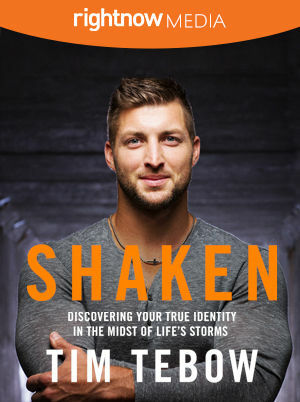 In Shaken, Tebow talks about what he's learned along the way, building confidence in his identity in God, not the world. This moving series features practical wisdom from Scripture and insights gained from others who have impacted Tebow in life-changing ways. Though traveling hard roads is not easy, it's always worth it!